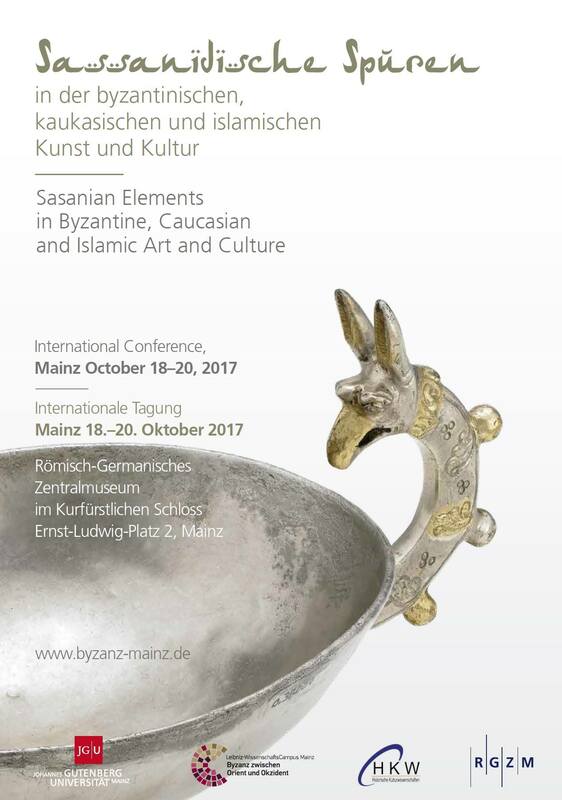 International Conference of the Leibniz-WissenschaftsCampus Mainz: Byzantium between Orient and Occident. Cultural exchanges between Christianity and Islam, especially between Byzantium and its Islamic Neighbours, but also in the Caucasian region, have been an attractive topic for historians, art historians and archaeologists in recent years. Scholarly interest focuses on diplomatic gift exchange, trade, the mobility of artists and the common motifs in both Christian and Islamic objects. The stage extends from Spain to Afghanistan and justifies the necessity of this debate. Yet, unfortunately, the role of one of the important protagonists of this exchange, namely the Persian Sasanians, is less well researched, although many important artistic and cultural phenomena in Byzantium, Armenia, and Georgia as well as in the Islamic countries can only be understood when this culture is included. The Sasanian Empire (224-651 A.D.) extended over a large territory. In Late Antiquity and the early Medieval Era, it ruled the whole area of modern Iran, Iraq, Azerbaijan, Pakistan and Afghanistan. The Caucasian region was exposed to its political influence. Until the middle of the 7th century, Sasanians were the major rival of the Late Roman and Eastern Roman (Byzantine) Empire and exported art and culture into these civilizations through various means and on different levels. The cultural connections ended after the fall of the Sasanian Empire, which was replaced mainly by Arab Muslims, and a new era began: the new owners of the territory then adapted Sasanian elements into their own culture. From the10th century onwards, the Turkish dynasties such as the Ghaznawids (963-1186) or the Great Seljuks (1019-1157 / de facto until the 13th century) settled in Persia and styled themselves as the successors of the Sasanians as well as as Turks; hence, they were called “Persians” in Byzantine sources. The Sasanian artistic and architectural tradition continued to exist in these cultures. The same phenomenon also applies to the Turkish Rum-Seljuks, who founded their empire in Anatolia: Persian was the court language, the sultans were named after Sassanian heroes from the Shahname (Keykubad, Keyhusrev, Keykavus), and despite the religious prohibition, drinking scenes were depicted in the artworks and wine played an important role at the ceremonies and celebrations according to the Sasanian model. As can be clearly seen, the Sasanian Empire had not only ‘transfused’ its art and culture to its neighbourhood during its prime time, but also influenced the successor states after its decline. Just as Ancient Greek and Roman culture played an important role in the formation of Western Europe, the Sasanian Empire bequeathed, a remarkably rich cultural heritage to the Christian and Islamic East. The conference “Sasanian Elements in Byzantine, Caucasian and Islamic Art and Culture” succeeds “Der Doppeladler. Byzanz und die Seldschuken in Anatolien vom späten 11. bis zum 13. Jahrhundert”, which was held at the Römisch-Germanisches Zentralmuseum, Mainz in October 2010. The first event dealt with the cultural relations between Islam, particularly Turkish Islam, Byzantium and the Caucasus. At the forthcoming conference, we aim to discuss the role of the Sasanian Empire in the process of cultural exchange before and after its decline.